For other places with the same name, see Lincoln station (disambiguation). Lincoln is an elevated station on the Millennium Line of Metro Vancouver's SkyTrain rapid transit system in Coquitlam, British Columbia. It is located on Pinetree Way, situated between Lincoln and Northern Avenues. 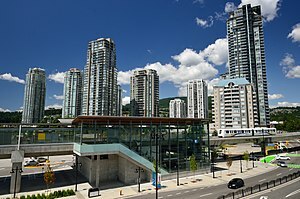 Coquitlam Centre and Henderson Place Mall shopping centres are located within walking distance from the station. Lincoln station was built in 2016, and opened along with five other stations when the Millennium Line's Evergreen Extension was completed. The initial plan for the extension did not include Lincoln station as it was determined that Coquitlam Central station would be sufficiently close to the nearby shopping centres and various amenities; however, the owners of the Coquitlam Centre mall and the developers of other nearby residential projects paid for its construction. Lincoln station is served by a single entrance facing the north end of the station. The entrance is located at the southwest corner of the intersection of Northern Avenue and Pinetree Way. Wikimedia Commons has media related to Lincoln station. ^ "2018 Transit Service Performance Review – Average Daily Boardings per Weekday". translink.ca. TransLink. Retrieved April 25, 2019. ^ "Evergreen Extension". Retrieved December 1, 2016. ^ Brown, Scott (November 7, 2016). "TransLink will open Evergreen Line on Dec. 2". Vancouver Sun. Retrieved November 7, 2016. ^ "Tri-Cities rejoice: The long-awaited Evergreen Line opens". CTV Vancouver. December 2, 2016. Retrieved December 2, 2016. ^ O'Brien, Frank (January 31, 2018). "Developers pay up to keep transit plans on track". Vancouver Courier. Retrieved March 7, 2019. ^ TransLink. Lincoln City Entrance Locations (PDF) (Map). Retrieved February 24, 2019. ^ TransLink. "Lincoln Station". Retrieved January 9, 2017. This page was last edited on 7 March 2019, at 03:06 (UTC).